Rod Taylor played columnist Chris Andrews -- a variation on his Glenn Evans character from "Hong Kong" -- in this pilot for a series that was not picked up by ABC. The show aired only once, on March 27, 1962. After "Hong Kong" was canceled, public clamor prompted the network to try relocating the show to San Francisco. Filming for the 50-minute pilot began on Feb. 12, 1962, and Rod did scenes on location in San Francisco and also on the Universal backlot. Locations included the glamorous and recently opened Fairmont Hotel, where the newspaperman made his new home. 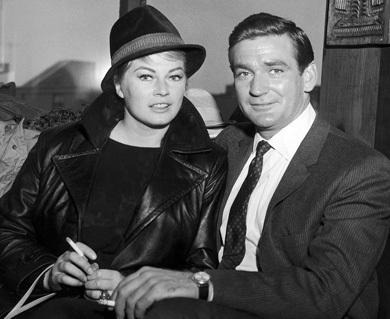 Anita Ekberg visited Rod on the set. "Dateline: San Francisco" is a rare TV show, and the only copy I have ever been able to locate is in the Film and Television Archive at UCLA. I was able to view the show during a visit to Los Angeles in April 2017, and here's a synopsis. The pilot episode was titled "Return to the City," and it's Chris Andrews who is returning after being on assignment in Paris, Morocco and other exotic locales. He has been called back home by the publisher of The San Francisco Observer to resume his popular column, Dateline: San Francisco. The publisher (played by Larry Gates) has another motive: He'd like Chris Andrews to reunite with his daughter (played by Barbara Rush) and be a stabilizing force following her ugly breakup with a local mobster. What they don't know is that the daughter is even more distraught over the fact that she hit the mobster with her car and left him for dead. A further subplot involves a crooked judge-turned-politician (Barney Philipps), a shady business mogul (Willis Bouchey) and the possibility that they have the publisher in their clutches. Rod is excellent in this role, and the episode is packed with great character actors. It's also brimming with atmosphere, giving a strong sense of time and place. Rod's character takes his date to a beatnik's pad to listen to a guitarist. In his role as columnist, he checks out a new jazz combo auditioning at the Fairmont Hotel. A lot of action takes place on the docks and wharves around San Francisco. And there's a very "Vertigo"-like scene when the publisher's daughter almost takes a plunge off a cliff near the Golden Gate Bridge. The pilot was written by the team of Ben Roberts and Ivan Goff (an Australian), and Jules Bricken was producer/director. Robert Buckner, the creator of "Hong Kong," was the executive producer. There's another version of "Dateline: San Francisco" -- a preliminary story written by Dorothy Robinson and Robert Blees (available in the archives of the University of Iowa Libraries). The episode is titled "The Castle" and the action takes place at a location clearly based on the Hearst Castle. Just like the Roberts/Goff version that aired, the Robinson/Blees version of the story has named the protagonist Chris Andrews (rather than Glenn Evans). Similarly, he has an apartment in San Francisco's Fairmont Hotel and writes for The Observer. The Robinson/Blees story opens with Andrews receiving a special invitation from publishing magnate Walter Walsh, aka "The General" (clearly based on William Randolph Hearst, aka "The Chief"). Andrews figures The General will try to lure him into working for his newspaper. Andrews isn't interested, but he wants a weekend at The Castle and the experience of rubbing elbows with authors, starlets, heads of state and other luminaries. Andrews finds a starlet all right, but he also finds a big mystery: The General is missing. When Andrews figures out the plot, he gets a big scoop for The Observer. The change in title from "The Castle" to "Return to the City" likely reflects budgetary restraints. Plenty of drama surrounds "Hong Kong" and "Dateline: San Francisco" behind the scenes. A January 1962 column by Erskine Johnson, the Hollywood correspondent for the Newspaper Enterprise Association (NEA), said that ABC had been deluged with about 11,000 letters of protest over the cancellation of "Hong Kong." The column assures readers that Rod would be returning to TV as Glenn Evans, but in "Dateline: San Francsico" rather than "Hong Kong." A big talent agency, which sold the show to the network, had a falling out with the TV bosses of the 20th Century-Fox Studio, where it was financed and filmed. To continue the "Hong Kong" series, the studio would be required to make $14,000 weekly commission payments to the talent agency. The big studio was so mad at the big talent agency that the show was scrapped in its 26th week. The sponsor [Kaiser Industries], of course, was howling mad. "Don't worry," said the studio, "we will film a new show starring Rod Taylor." So the new show, "Follow the Sun," was filmed, but without Mr. Taylor ... While all the bickering was going on, Taylor went to Italy to star in a movie for MGM. In reply to public clamor, the 26 "Hong Kong" shows are on the third rerun and filming starts next month on "Dateline: San Francisco." The new show is slated to start in September, perhaps sooner. And in agreeing to move his office from Hong Kong to San Francisco, Taylor won a contract for three big-screen 20th Century-Fox movies as a bonus. 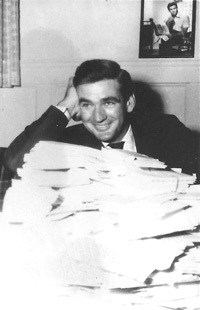 Millionaire industrialist Henry Kaiser, owner of Kaiser Industries, was a big booster of Rod Taylor and tried to get his favorite actor into another show. "They call each other 'Dad' and 'Son.' No other actor I know enjoys this kind of friendship with a former sponsor," a Torrance, California, columnist noted in March 1962. Rod was confident of the new show in a January 1962 interview, "Because the sponsor, as it now stands, is to be none other than my adopted dad, Henry Kaiser. He sent the word: 'If it has Taylor in it -- buy it.'" Later, in a 1965 fan newsletter, Rod reported that the pilot was finished too late to get a good network time, so it was shelved by the studio. However, it left Rod free to star on a much larger screen! Hong Kong: The original Rod Taylor series. "The Castle" story treatment can be ordered from the Special Collections Department at the University of Iowa.